Mass of Christian Burial will be celebrated by Fr. Bruno Santiago at 11:00 a.m. Monday, January 15, 2018, at the Cathedral of the Holy Trinity in New Ulm. Burial will follow at the New Ulm Catholic Cemetery. Visitation will be 1 – 4 p.m. Sunday and 9:00 – 10:30 a.m. Monday at Minnesota Valley Funeral Home, NORTH CHAPEL, in New Ulm. The Christian Mothers Society will pray the rosary at 4 p.m. on Sunday at the Cathedral. Born on November 9, 1927, to Anton and Mary Josephine (Kachelmeier) Herlick, Collette resided in New Ulm her entire life. She attended Holy Trinity Grade School and graduated from Holy Trinity High School. Collette wed Stuart P. Groebner on May 26, 1947, at Cathedral of the Holy Trinity; they were blessed with six children. 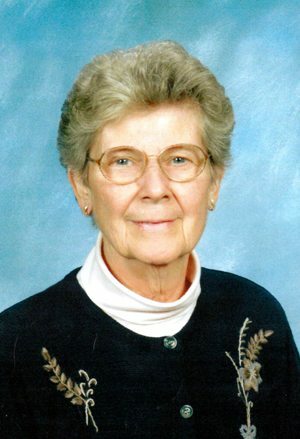 Collette took good care of her family and enjoyed many friendships. People remember Collette’s silly sense of humor, Scrabble-playing skills, enjoyment of gardening and traveling, and fervor for good posture and proper grammar. Collette never quite recovered from the loss of her husband, Stuart, in 2005. She was preceded in death also by her parents; sisters, Veronica Herlick, Marie Welch, and Carol McGrath; and her brothers, Alexander, Arthur, Anton, and Randolph Herlick. Collette’s life is celebrated by her children, Richard (Sandy) Groebner of San Diego, Philip (Jeanne) Groebner of St. Peter, Daniel (Mary Gulden) Groebner of New Ulm, Brian Groebner of Readstown, WI, Douglas (Peggy) Groebner of Papillion, NE, and Mary (Jerome) Meeds of Marine on St. Croix, MN; 17 grandchildren; 13 great-grandchildren, sisters-in-law, Lois Bode and Ruth Polta; brothers-in-law, Tom Groebner and Richard (Mary) Groebner; and numerous nieces, nephews, and other relatives and friends. Our memories of Collette will be cherished always.